The international media showed a great interest in Gábor Vona’s press conference in Budapest on Friday. 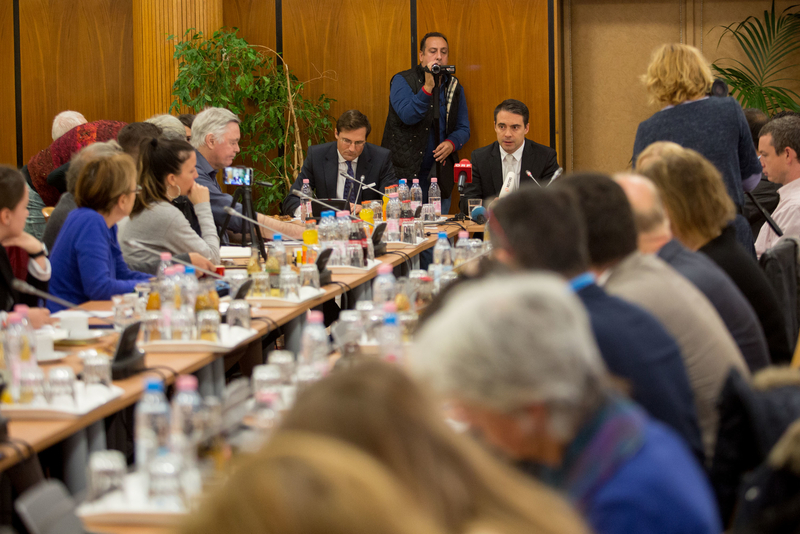 After giving a brief overview of Hungary’s current domestic political situation, Jobbik’s president and candidate for Prime Minister outlined his party’s programme and answered questions from journalists. Mr Vona began by noting how the seven years of Viktor Orbán’s rule showed why it was so important to protect democratic institutions. He also expressed his opinion on George Soros but emphasized that the Orbán Plan posed a bigger threat to Hungary than anything else. In his press conference for foreign journalists working in Hungary, Gábor Vona explained how Fidesz had maintained its leading position in Hungary’s political arena since 2010. According to Fidesz’ own assessment, the governing party originally had two entities to contend with: Jobbik on its right and the left-wing parties on its left. “This situation has changed by now,” the party president asserted. In his opinion, the left is in a deep crisis as their last considerable Prime Minister Candidate László Botka has stepped down. Talking about the other players on the left, he said they were struggling for survival. Writing Ferenc Gyurcsány off as an incapable candidate, he noted that Bernadett Szél and Gergely Karácsony lacked the organizational support to be realistic challengers for Fidesz. “Even six months before the elections, the bronze medal can already be handed out to the left,” Mr Vona stated. He added that “it does glitter nicely, but it’s the gold medal that Hungary is interested in”. As far as Fidesz was concerned, Jobbik’s president and PM candidate emphasized that the deep layers of the society already showed the signs of an upcoming change even when poll figures did not. To support his statement, Mr Vona said that, of all the candidates, he was the one touring the country the most regularly and holding the most rallies; and he noticed people being generally fearful, which prevents them from giving a straight answer to pollsters, too. Referring to his discussions with the managers of polling institutes, he said they needed twice as many phone calls as before to register the necessary amount of responses since twice as many people refused to answer political questions. He believes that Fidesz is over- while Jobbik is under-measured in the polls now. In response to a question from the media, he recalled how Jobbik’s real 2014 ratings were only revealed in the last pre-election polls, showing that the party’s actual figures were double of the numbers published earlier. Naturally, it did not mean that Jobbik’s popular support soared in the last minute. On the contrary, the polls were inaccurate and showed a false picture earlier. In Mr Vona’s view, the situation may be the same now: Jobbik far outperforms its current poll figures as many people refuse to give a response to the polling institutes. He contrasted Fidesz’ anti-democratic trends with Jobbik’s consolidation, the essence of which lied in Jobbik’s progress into a people’s party. Adding that it wasn’t just Gábor Vona who who had transitioned into a people’s party leader, he emphasized that his party had fully identified with the process as all of its decision-making bodies had adopted the manifesto laying out Jobbik’s fundamental values. “Jobbik is looking to the election campaign with due humility and the necessary confidence because, considering the state of the left, we feel we have the chance to win the elections in 2018,” Mr Vona asserted. Before going on to talk about Jobbik’s political programme, the president and PM candidate said the government’s agenda had clearly been reduced to generating hysteria in Hungary using the migration issue and George Soros. Mr Vona explained that Viktor Orbán was utterly grateful for each attack on his government from Brussels because they helped him show that he was the one to protect Europe from migrants and so he must be re-elected in 2018. Instead of this manipulative political maneuvering, Jobbik wants a new social consensus to surpass controversial 20th-century ideologies and left-right divisions as these notions have “lost their relevance” in the 21st century. “21st-century politics must be built on solutions instead of -isms,” Mr Vona said. Jobbik’s president and PM candidate raised the need for a new economic policy. In his opinion, the state, multinational and Hungarian enterprises should make a trilateral agreement since so far they have always formed alliances at each other’s expense. Identifying the five pillars of Jobbik’s new economic policy, he mentioned competitiveness, productivity, innovation, sustainability and wages. Without going into details at this point, he stressed the importance of a new healthcare and education policy as well. He did note however, that each area would be represented by a Minister in a future Jobbik government. Gábor Vona also talked about the European Citizens’ Initiative for a Wage Union which aims to create a more liveable, fair and single-speed European Union of solidarity. He expressed his view that the wage union initiative incorporated the EU’s reform. Then the journalists were shown the campaign video of the wage union initiative. In the subsequent discussion, Jobbik’s president and PM candidate named the Visegrad (V4) Group a key factor for Hungary. He added that the V4 Group could be the foundation for strengthening the EU as well. 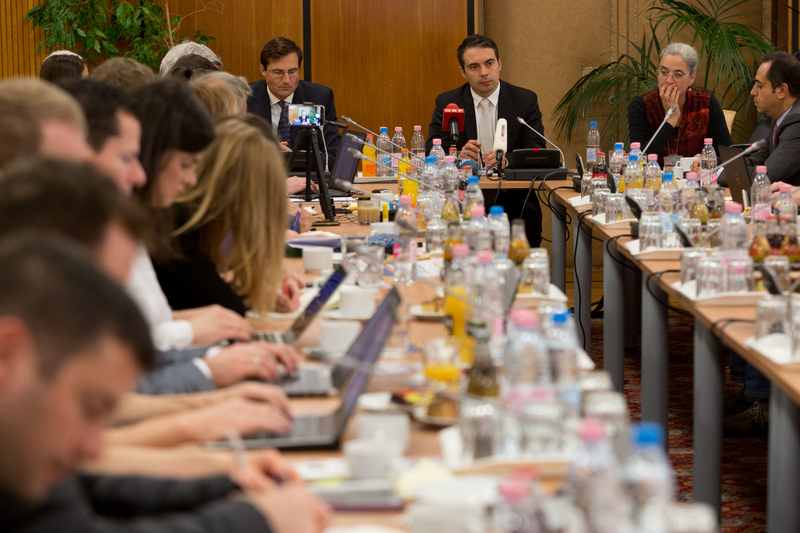 Mr Vona called the media’s attention to Jobbik’s motion to establish a joint V4 parliamentary assembly. The idea is to make the Visegrad Alliance more powerful and stable by giving it a wider popular support. Answering media questions, Mr Vona expressed his opinion on the Soros Plan: he said he did not know if it existed or could exist at all, but he thought he would be trapped in a manipulated debate if he addressed the issue, and he knew “Viktor Orbán very much wants” him to keep talking about matters like that. What he is certain of, he said, is that the Orbán Plan exists and it poses the biggest threat for Hungary at the moment. Jobbik’s president and PM candidate pointed out that Jobbik’s transition into a people’s party did not change their opinion on George Soros, whose ideology they disagreed with, but it was Viktor Orbán who they wanted to oust from power. He informed the foreign press that Jobbik had pressed charges against George Soros to make the authorities officially declare if there was such a thing as a Soros Plan. The fact that no investigation was started in the matter so far questions the existence of such a “plan”. Referring to the upgrade of the Paks nuclear plant, he said Hungary’s energy-dependency must be reduced but the country needed the atomic power plant in mid-term. He also remarked that the financial part of the expansion agreement had to be clarified.